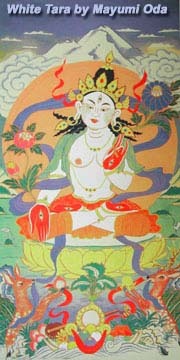 White Tara is the goddess of compassion. Her love heals the at the source of dis-ease, bringing health, strength, longevity and beauty. Meditations. This will be a place to put invocations, thoughts for the days, prayers and/or a visual to meditate on. One visual that has been invisioned by White Tara Moriah St. Clair is 1000 arms spinning around a circle with a light and/or vibrating heart in the center. David drew a 1000 honeycombed tear where I envisioned as each Tara was named a sectioon would light up. I would like this to be on large billboard inTimes Square as the world watches creating this dream together.